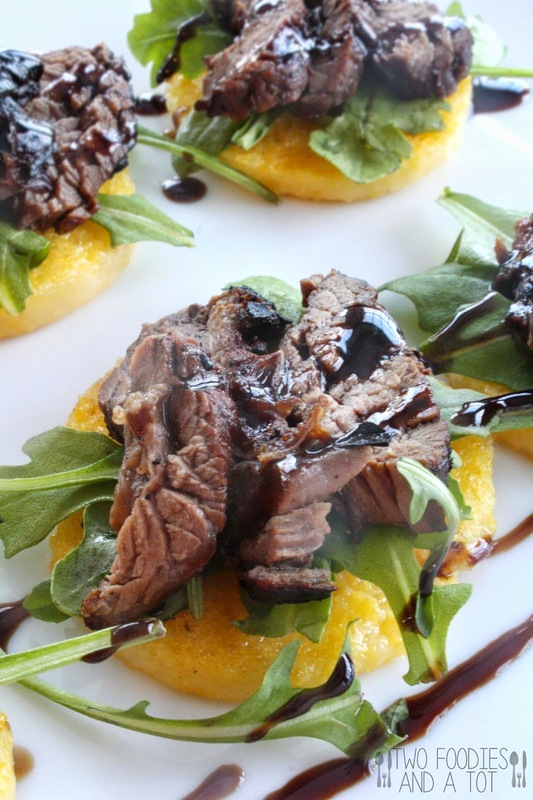 Nutty yet crispy grilled polenta with slightly spicy baby arugula and tender steak with sticky balsamic glaze. OMG, so yummy. I just LOVE polenta. It's so simple to make polenta at home but yet, it's even easier to buy a cooked polenta log so I always go the lazy way. I always have to grill extra polenta as my tot devours these. If you prepare it in advance, like marinating ahead, this is a great, quick appetizer(takes just less than 10 minutes to cook) to please guests or a fabulous small portion lunch. 1. Mix all marinade ingredients in a bowl and marinate skirt steak for at least 30 minutes. 2. In a sauce pan,add balsamic vinegar and bring to a boil. As soon as it start boiling, turn the heat to simmer and simmer for 10 minutes or until it reaches syrupy consistency to make balsamic glaze. 3. Heat oil in a grill pan and grill polenta until golden brown on both sides. I grill about 3 minutes each side. 4. Grill the steak about 3 minutes each side and remove from the grill pan or grill. Tent it with a foil and let it rest for 8-10 minutes. Slice thinly. 5. 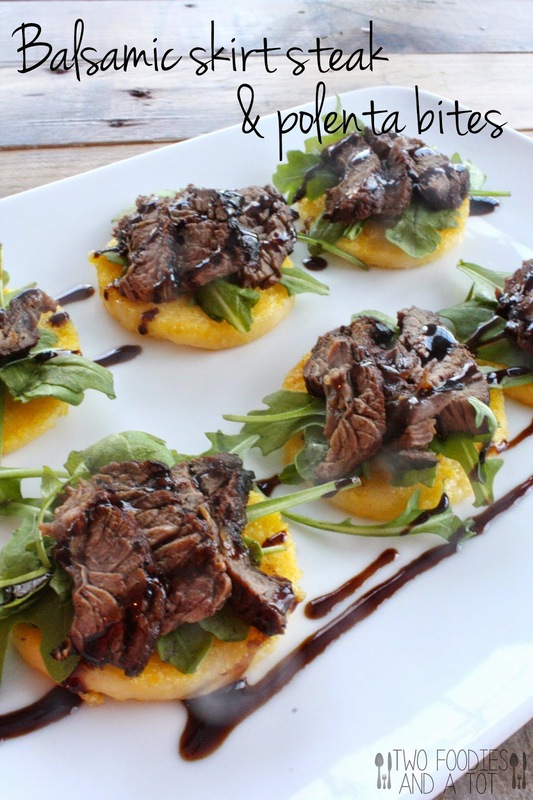 Arrange grilled polenta on a plate and top with baby arugula and skirt steak and drizzle balsamic glaze. * Marinade recipe by Pointless meals.